Father: Cecil Hambly Hansford (February 3, 1899-January 2, 1964). Gordon Hansford went to school in Wolfville, graduating from grade 11 in 1940. When World War II broke out, he joined the army and served as a drummer in the Pipe Band at Aldershot Camp. He then transferred to the Ordnance Corps, to get overseas, and took an electrical engineering course. He went overseas in January, 1943, from Hoboken, New Jersey, on the Empress of Scotland. He sailed from Scotland in June of 1943 and went to Algeria, North Africa. He then went on to Sicily, Italy, through France to Belgium, Holland, and as far as Oldenburg, Germany. Halfway to Italy, he was transferred to the Royal Canadian Electrical and Mechanical Engineers. He served with the First Canadian Infantry Division and First Armoured Brigade, coming home in January, 1946, with a collapsed lung and an enlarged heart. On the advice of his father, he went back to school, getting a Bachelor of Arts, Bachelor of Education, and Master of Arts in economics from Acadia University in Wolfville. 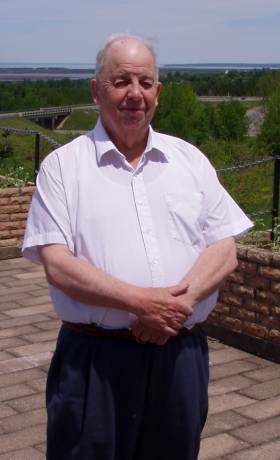 He went into teaching in 1953 at Central King's Rural High School, then moved on to Halifax County Vocational High School, and Kingstec (later a Community College) at Kentville, retiring in 1983. While teaching in Halifax, he joined the First Field Regiment, Royal Canadian Artillery, attaining the rank of Major. He married Helen Gale Thomas (b. February 7, 1935) on July 25, 1968. He had quite a few hobbies and interests--painting, wood carving, singing in a gospel choir, playing the bagpipes, and playing the old-time fiddle. He designed coats-of-arms for King's County, Kingstec Community College, town of Wolfville, King's Historical Society, the Hansfords, and for several other organizations. Gordon and Helen were actively involved in the United Church and were instrumental in raising funds for a new hospital in Kentville. He had an active role in the Kentville Historical Society.